Helena, the capital of Montana is slowly also becoming a capital for Tibetan awareness here in the Northwest of America. Apart from visits from Tibetan artists, Helena has several regular Tibetan events that are fairly well known. For several years now, the Tibetan Losar celebrations at the Covenant Church has been a regular item on our calendar. The Feathered Pipe Ranch now hosts our annual Saga Dawa prayer gatherings where we put up new Tibetan prayer flags and re charge our spiritual batteries. 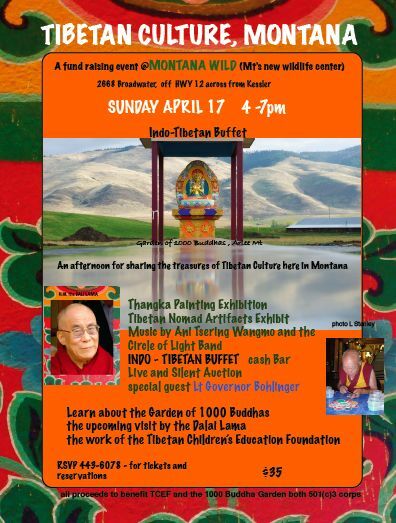 More recently, we celebrated the Tibetan Culture in Montana event at the new Montana Wilderness Center. Apart from these regular events, we’ve done events around inspirational Tibetan movies. A few years back we organized a Tibetan film festival here in Helena that was very well received.